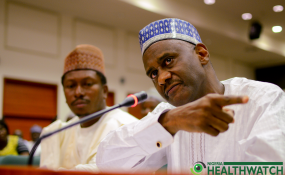 The embattled suspended Executive Secretary of National Health Insurance Scheme (NHIS), Prof. Usman Yusuf, has denied news making the round that he has dragged the presidency to court over his purported suspension by the governing board of NIHS. The governing board of NIHS had on October 19, 2018, placed Yusuf on indefinite suspension litany of allegations of wrongdoing levelled against him by workers. Counsel to the embattled NHIS boss, Uche Val Obi (SAN), in a statement issued yesterday, said his client never instituted any suit against the presidency as reported in the media. According to Obi, who is the Managing Partner of Alliance Law Firm, "there is no iota of truth in this story, and he has not taken the president or the Secretary to the Government of the Federation (SGF) to court as alleged. "Instead, our client had, through our firm, approached the Federal High Court vide an originating summons filed on October 29, 2018, in suit No. FHC/ABJ/CS/1220/2018, as the plaintiff while NHIS, Minister of Health and the SGF were named as defendants. By this action, he was essentially seeking the judicial interpretation and determination of certain questions pertaining the propriety or otherwise of the governing council's action in suspending him from office without presidential approval or following due process of the law as well as consequential orders to set aside such suspensory actions of council including its appointment of a General Manager in the NHIS to act in his place during the period of the purported suspension. "This suit was served on the listed defendants on October 30, 2018, before our client received the letter from the office of the SGF on October 31, 2010, at 4.30p.m. from the Minister of Health directing him to proceed on administrative leave on the approval of the president. "Having received the presidential directives as conveyed in the SGF's letter aforesaid, our client hereby confirms that he welcomes the presidential intervention and remains obligated to fully and strictly comply with the directives. He will accordingly be proceeding on administrative leave with effect from November 5, 2018, so as to give room to the independent fact-finding panel set up by the federal government to carry out its important task of investigating the allegations of infractions levelled against him by the governing council of the Scheme." He added: "Similarly, our client wishes to pledge his continued loyalty to the president and to fully cooperate with the incoming overseeing director, Mr. Ben Omogo, with whom he has already met, and the panel set up by the presidency to deal with the matter. "In view of this development, to ensure that there is no interference with the work and finding of the panel and as instructed by our client, we shall be taking prompt steps to suspend the pending legal proceedings aforesaid."